This May, cambridge contemporary art is proud to present new paintings by Reg Cartwright, accompanied by Sarah Went’s ceramics and Michael Lythgoe’s sculptures. The exhibition runs from 30th April until 22nd May. You are warmly invited to the exhibition preview on Saturday 30th April from 11am to 1pm. Reg Cartwright is an award-winning painter and illustrator from Leicester whose work has been exhibited around the world. He began his career as a graphic designer and became a full-time painter and illustrator in 1976. As an illustrator, he is well known for a series of picture books for young readers which he created in collaboration with his wife Ann. As a painter, he creates deceptively simple-looking still-lifes in which he renders everyday objects through subtle abstraction to focus on the tone, colour and physical qualities of his subject matter. Reg Cartwright returns to cambridge contemporary art for his eighth major exhibition. His paintings continue the tradition of British Modernism, calling to mind that of St Ives School painters Ben Nicholson and William Scott. Working primarily with still life, Reg uses familiar objects such as jugs, plates and flowers as a pretext for examining complex spatial relationships. His paintings are less about the objects he paints and more about achieving a balanced and pleasing composition, attaining this by flattening perspective, omitting non-essential details and focusing on tone. Michael Lythgoe was born in Liverpool in 1950 and trained as an engineer. During a holiday in the Cape Cod region he purchased an old wooden decoy which inspired him to change careers and become a professional artist, creating wooden bird and fish carvings. Inspired by the early North American decoys Michael's stylised curvilinear representations of wildfowl and waders have now evolved into a style and form entirely unique to him. His sculptures are curvaceous and calming, combining the eye of an ornothologist with the precision of an engineer. Each sculpture is unique, carved from blocks of wood and then sympathetically painted. Sarah Went is a Cambridge-based contemporary slipware potter who uses the traditional techniques of slip-trailing and sgraffito to create texture and pattern. Her work is hand-thrown on the potter’s wheel and individually decorated. 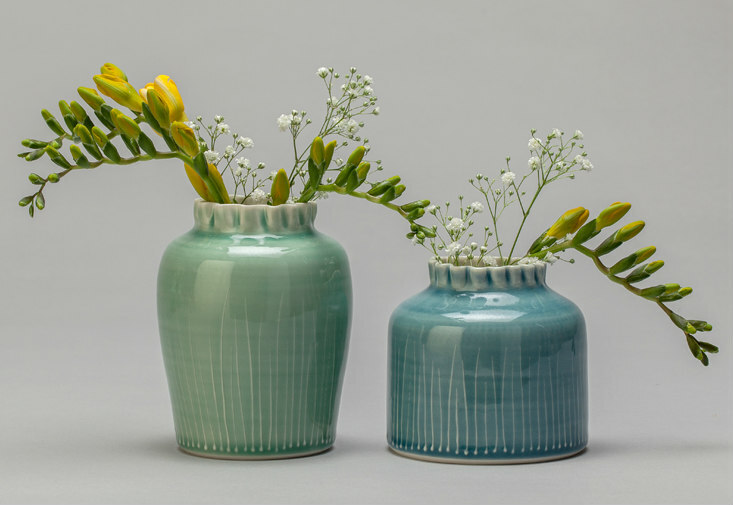 Sarah uses porcelain clay which gives a delicate translucent quality to her work and is perfect for the soft, subtle colours that she uses. When making her glazes, Sarah aims for natural colours reminiscent of the sea, sand and plants around the coast or from her garden.